Copper ion solutions. Left: 0.5M copper sulfate water solution has a blue colour due to copper aquo complex ( (Cu(H2O)6)2+ )formation. Centre: after concentrated hydrochloric acid is added to the solution, tetrachlorocuprate complex ( (CuCl4)2- ) is formed and the solution colour changes to green. 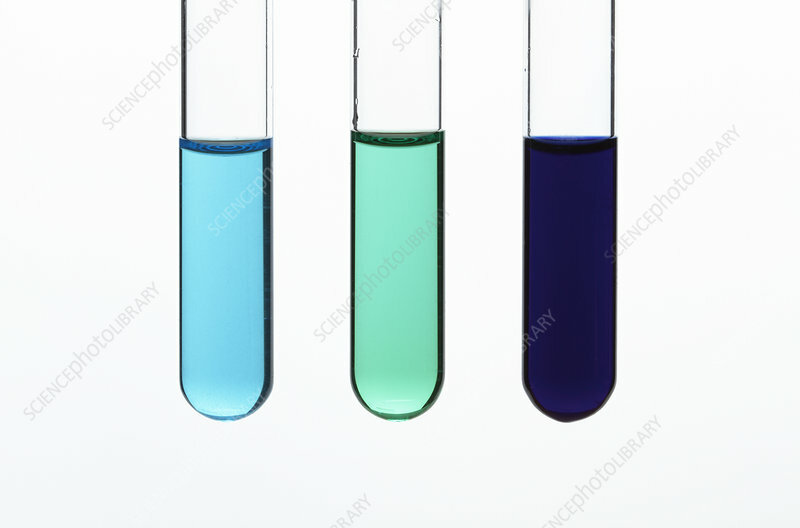 Right: after excess ammonium hydroxide is added to the original solution and tetraaminediaqua complex ( (Cu(NH3)4(H2O))2+ ) is formed and the solution colour changes to dark blue.